These days, at the heart of every great digital marketing strategy lies great content. But, if you do it wrong, you will waste time and money churning out sub-par content that never leads to sales and profits. According to the Content Marketing Institute, content marketing generates three times as many leads as traditional outbound marketing, and at a fraction of the price. Even more impressive, brands that have adopted a content marketing strategy experience a conversion rate nearly six times higher than their competition that haven’t. With stats like these, it’s no wonder that more marketers are investing more time, energy, and resources into their own content marketing strategies. As the content marketing landscape and best practices continue to evolve rapidly, it can be hard to know what you’re doing right and what you’re doing wrong in your own strategy. In your own words, how would you define “Content Marketing”? What was your content marketing strategy like? What’s the biggest mistake you find people make with their content marketing efforts? We’ve moved on from simply needing to provide the best in-depth articles out there, to having to consider things like video, infographics, and SEO. In order to get the most out of your own content marketing efforts, make sure you know how to navigate this constantly changing landscape. 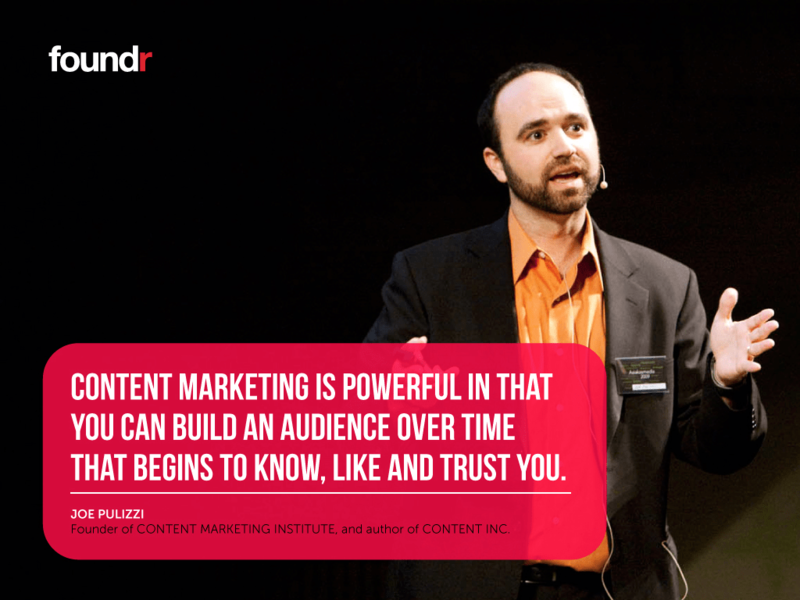 Joe Pulizzi, Founder of Content Marketing Institute and Author of Content Inc. Content marketing is an approach where an enterprise creates valuable, relevant, and compelling information to a targeted audience to develop some kind of behavior change over time. Even as advertising is increasingly less effective on most channels, we now have an opportunity to reach consumers directly. Content marketing is powerful, in that you can build an audience over time that begins to know, like, and trust you because of the content you send, and that creates a customer or a develops a better customer over time. Content marketing is powerful in that you can build an audience over time that begins to know, like, and trust you. At Content Marketing Institute, we developed a mission to be the “how-to” destination for enterprise marketers to understand and employ the practice of content marketing. We initially started with a daily blog and continued that blog for three years until we built an audience of over 30,000 email subscribers. Then we diversified into our event platform, our quarterly magazine, and our podcast. Today we have approximately 200,000 subscribers to our content. Our top priority, over everything else, was keeping and growing our email subscribers. Our top priority, over everything else, was keeping and growing our email subscribers. Remember that more content is not necessarily better. Consistency is key. It takes time to build a loyal audience (usually 18-24 months). Also, marketing can actually be its own profit center. Content marketing is an approach to business (not just marketing) that uses a purpose-driven strategy to create and consistently distribute valuable and relevant content. The goal is to drive the growth of a business by attracting and keeping the interest of a specific audience. This subscriber base will ultimately make up the customer base by either expanding what exists for current products or services, or by delivering additional value and generating revenue on its own. Content marketing is more relevant than ever, not just as a marketing tactic, but as a business model. Content marketing is more relevant than ever, not just as a marketing tactic, but as a business model. Marketers continue to use it because, when done well, it expands a brand’s reach by building trust with an audience that may otherwise ignore it, improves the sales process, and retains and upsells customers. I saw that the biggest problems aren’t “how to,” but rather “why to.” I shifted into helping marketers think differently about the work that they do and quit taking orders blindly. That’s when my strategy shifted into thought leadership, not just for marketers, but for business executives in any area of responsibility. When I started out, I wrote guest blogs strategically. It wasn’t about getting in front of as many people as possible; it was about getting in front of the right people. Then I began building the subscription list for my own website and brought people there, always looking at what I can offer that’s valuable to my audience. It wasn’t about getting in front of as many people as possible, it was about getting in front of the right people. I take SEO into account, but I’m not driven by it. I tend to produce written content because that’s my background (I’m the author of seven books. The latest is Experiences: The 7th Era of Marketing, co-authored with Robert Rose.) and I’m now getting into more video. The biggest mistake that I see people make with content marketing is that it lacks creativity. Companies look at iconic brands and say they could never do that level of great work. They give away their power to amaze and delight their audience. Instead of using the work of great brands as inspiration, they discount it. It’s time to quit making excuses and start connecting the dots between what inspires you and what you do. The biggest mistake people make is not creating content that’s significantly better than what’s out there. Even solid, well-written, long-form, useful content won’t get you too far if there’s better content out there on the same topic. The biggest mistake people make is not creating content that’s significantly better than what’s out there. This is reflected in our content strategy for ourselves and our clients. We recently created what we refer to as a “10x piece” on live chat best practices; it’s an in-depth, well-designed piece that is genuinely better than what’s out there. These pieces serve as the cornerstones of our content marketing and link-building efforts, because they make securing guest posts, earning links, and driving social shares 10 times easier. Content marketing is the primary means of driving inbound traffic to your company’s site. It’s crucial for lead generation, SEO, engagement, and education. If you’re not using content marketing as part of your marketing strategy, you’re missing out on huge potential for growth. If you’re not using content marketing, you’re missing out on huge potential for growth. The main strategy at Venngage for content marketing is to create content that educates our existing users on our product, as well as produce original research and infographics that drive new visitors back to the site. The biggest mistake I see most marketers make is that they rush into the topic selection process or they jump right into writing. Quality content requires planning. In fact, 75% of the process should be focused on planning and research, and only 25% should be on writing. Unlike advertising, content marketing attracts an audience to a brand by publishing and promoting practical or entertaining information, then inspiring those visitors to take a profitable action. Content often takes the form of articles, but may include videos, podcasts, tools or live events. Promotion channels are typically search optimization, social media, and email marketing. Content often takes the form of articles, but may include videos, podcasts, tools or live events. Our content is where digital marketers find helpful, practical advice about search optimization, analytics, and content marketing. Our goal is to help businesses get more value from their websites. That’s our “content mission statement,” which defines the audience, topics, and the benefits to the readers. The bigger strategy for the business is to rank high for all of the commercial-intent phrases in our industry, and to do so by having a high-authority website. We grow our authority by publishing research on high-value topics and building relationships with influential bloggers. We also have a book, an annual conference, a monthly teaching event, and a podcast. In the end, we drive 80,000 visitors per month and 750 qualified leads per year, all while spending $0 on advertising. It’s all about the content. In the end, we drive 80,000 visitors per month and 750 qualified leads per year, all while spending $0 on advertising. Most marketers I know don’t use data to drive decisions. Google Analytics is a decision support tool. 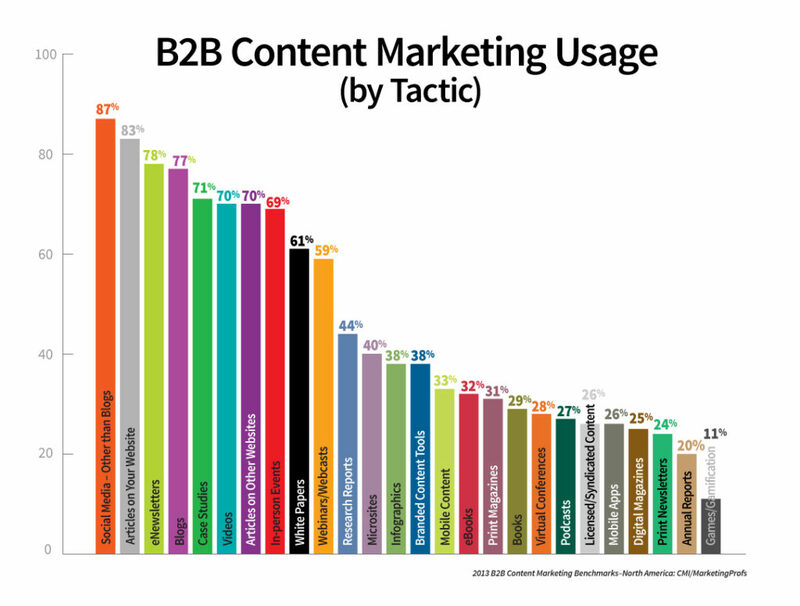 But a lot of content marketers just go with their gut, without learning which traffic sources and content drive visits and conversions at what rate. They’re wasting lots of time. Content Marketing is the fuel for all other marketing initiatives. Well-written, strategic content distributed to your target audience is the most effective way to scale education and trust with your potential customers—that is why content marketing is so incredibly effective. Our content marketing strategy has evolved over the last five years of being in business. We’ve gone from only focusing on getting guest posts published, to focusing way more on what we do with the content once it’s been published. We look for how content can be used in our marketing, sales, recruiting, and retention initiatives with clients and potential employees. One thing we make sure we do every quarter is update our documented content strategy. One thing we make sure we do every quarter is update our documented content strategy. So many companies say they “do content marketing,” when really they just have one person on their team who is writing an article a week for their company blog. That is not a content marketing strategy, it’s blogging. Companies need to invest the time, resources, and people into a well thought-out content marketing strategy if they actually want to reap the benefits down the road. It’s a process utilized to produce and publish content that ranks very high for the keyword your customers use to search on Google, YouTube, SlideShare, or any other platform. It’s probably the most sustainable way to build consistent traffic to your website without spending more and more money on ads. For example, I rank #1 for “funny email sign offs” with an article on my blog. This search term alone gets 100,000 to 10 million pageviews. I can now sit here and do nothing and my article just brings me thousands of visits every single day. Content marketing and SEO have become very closely related. They both work together. For example, I might write an article for my blog that I want to rank really high for the word “email endings,” and then recycle that content to write guest articles on other publications about this same topic, linking back to my original article on my blog for the full reference. Content marketing and SEO have become very closely related. They both work together. I can create SlideShare presentations and YouTube videos with that exact same content and link back to my original article to get it to rank higher. Here is my case study on how I ranked at #3 on Google in 14 days. Focus on quantity vs. quality. I get 100 people who subscribe to my blog every single day from 1,000 visits every single day, and I have a total of maybe six solid articles. That’s 30,000 uniques per month with six solid articles! It’s all about quality. I revise and improve these articles every single day. I spend about two to three months writing one of these articles. My day to day is improving articles and not writing new ones. My day to day is improving articles and not writing new ones. Content marketing in 2017 means using content to solve prospects’ problems, earn their trust, bring them into your marketing funnel, and hold their hand until the sale (and even after). I think so many marketers are still using content marketing because it’s a friendly way to sell and earn customers. You’re giving them something—information, entertainment, whatever—that they want or need, and when it’s good, they continue to give you their attention in return. I’m a big fan of “borrowing audiences” as a fast way to grow your brand. I’m a big fan of ‘borrowing audiences’ as a fast way to grow your brand. Things like guest blogging, joint ventures, influencer marketing, and even traditional PR are great because you’re getting put directly in front of an already engaged audience. And with something collaborative, there’s also that “borrowed trust” where someone else’s audience will immediately trust you more because of that connection. Content marketing is creating relevant and interesting content for your target customers that helps solve their problems with the goal of developing trust in your brand. As a freelance B2B content writer and strategist, I have developed content strategies for many brands of all sizes and industries. I always start by understanding the problems of the target customer and then determining what information they need to solve these problems. Start by understanding the problems of the target customer and then determine what information they need. I also research what content competitors are producing and then come up with an angle that is unique—it might be the delivery, the tone, or the subject. There is no one-size-fits-all when it comes to content strategy. As far as using video over articles, the answer really depends on the client and the brand’s target audience. For my own freelance writing business, I decided to start a blog in 2013, because I saw that there was no one else providing content for journalists transitioning to content marketing. Since SEO was a consideration, I purposely chose “The Content Marketing Writer” as my blog title, since people looking to hire me would search for these terms. For the past four years, I have not focused on keywords, but instead on providing content that answers the questions I hear in the freelance writing community. This strategy landed me the #1 spots on Google for the term “Content Marketing Writer,” which has been responsible for helping many of my clients find me. Creating content that is a thinly veiled advertisement, or even one that is not so thinly veiled is a mistake. Customers are smart these days, and know which brands are just pretending to provide information, and which are really focused on selling. I also see many companies that think content is a quick fix and give up too quickly when they do not see results within a few months. Each piece of advice shared by these content marketing experts is designed to help you take your own content marketing strategy to the next level. One thing I’ve certainly taken away from this is that there is so much more to building an epic content strategy than simply creating awesome content, and that integrating SEO is now more important than ever. As I’ve read through all these amazing responses, I can’t help but think about how important it is to be creative and willing to try new things. There is no one-size-fits-all approach with content marketing, which is why it’s so important to be constantly thinking outside the box in order to stay ahead of everyone else. What lessons have you learned about content marketing? What piece of advice gave you food for thought? What does your own content marketing strategy look like? Let us know in the comments below! Some interesting tips in here. Andy Crestodina’s quote should make you stop and think. 1) What level of enquiries or sales does your content either directly, or assisted, bring to your business each month? 2) What’s your target for leads/sales? 3) How much more new content, additional traffic or increased conversion from current content, does that equate to? In essence before you do anything else – reverse engineer what works and amplify it by doing more of it, getting more eyes on it or by improving it. There’s your one sentence marketing strategy (and it works because we do it for our business).